looks great with all neutrals! This project does have a bit more required supplies than most, but it's still an easy project! I was a little worried that it would be hard to locate the quartz pieces I wanted, but was successful during recent visits my local bead store and Treasure Island Flea Market - about $1 per stone. I did have to search a bit for the cuff I wanted - I got mine at Forever 21, which I think will probably have a good selection of cuffs at any time. I would also check your local bead store or online to find a plain cuff to use. You also don't need to necessarily match your wire and cuff -I saw a picture of a similar bracelet that used mixed metal tones - gold wire and a silver cuff - which actually worked really well! Dab three fairly generous drops of glue onto your bracelet. 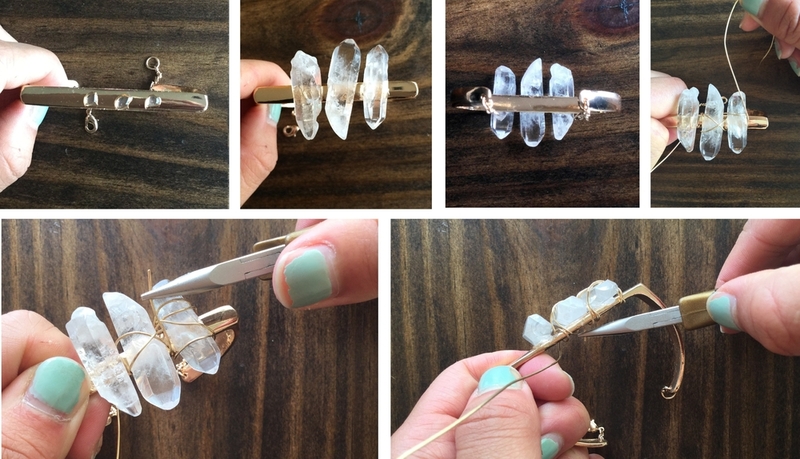 Press your quartz pieces onto the drops. Let dry - it'll probably be most stable drying upside down. Mine took a good couple of hours for the quartz pieces to be solidly attached to the bracelet. Use your hand or plier to pull the last ends of the wire tight and tuck them into a corner where they won't poke you or get caught. Use scissors to cut off any extra wire, if needed. Isn't it SOOOO cute?!? I'm so happy with it - I can already tell it'll be one of my go-to jewelry pieces!